FYI, we are the No. 1 Brown Bear company in the world with more entries in the World Record Books than any other company. Right now we have 25 bears in the top 50 spots and 37 in the top 60 spots in the books. That's twice as many as our nearest competitor! No other outfitter even comes close to our record book presence. We have been hunting Russia now for over 2 decades and during that time frame have taken over 1,000 people to Russia. We are pretty much 95% on everything we hunt. 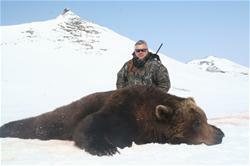 Our brown bear and moose hunts are especially successful. In Alaska right now, according to the Alaskan Fish & Game Department, the average bear is 7 1/2 feet. Our average bear is close to 9 feet. The success rate in Alaska is around 60 percent state wide. Ours is close to 100 percent. As far as a price comparison . . . an Alaskan Peninsula Brown Bear hunt is $19,600 WITHOUT a bear license (about $600) and WITHOUT the float plane or other transportation to camp (about $1,200) while our hunt is just $13,995 and we INCLUDE the license and transportation to camp. Now you can get some "coastal" bear hunts in Alaska for less money but they are so far up the coast where there are very few salmon streams and thus the bears are small in comparison to the Peninsula bears. Our bears which are similar to the Peninsula bears. I'm comparing apples to apples and not apples to oranges. 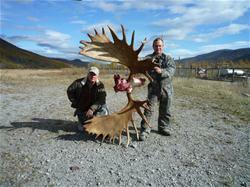 Our moose hunts are very productive as well. For example . . . according the the Alaska Fish & Game Department, the statewide success rate on moose in Alaska right now is 26 percent. The average moose taken is 53 inches. Meanwhile we are near 75% with an average moose a full 10 inches wider . . . 63 inches. But the best part is that we are whole lot cheaper as well. While an Alaskan moose hunt costs $15,000 to $17,000 WITHOUT the license (almost $600)and WITHOUT the float plane to camp (about $1,200) our moose hunt sells for $14,995 and INCLUDES the license and transportation to camp. Let us book your African hunt! WE know the best outfitters!